Background: Visual examination is the basis for diagnosing the carious lesions in clinical and field setting. Aims and Objectives: To determine the accuracy of identifying the carious lesions at different stages and their treatment options using photographs by dental undergraduates. Materials and Method: A total of 83 undergraduates (3rd year, 4th year and interns) participated in the study. A proforma with criteria for identifying the lesion and the treatment modalities were given. The photographs of lesions in different stages as diagnosed by experts were projected on the screen for 60 seconds during which the students were asked to identify the lesion and suggest the treatment option in the given proforma. Results: There were 23 (28%) 3rd year students, 38 (47%) 4th year students and 22 (25%) interns in the present study. Most of the times dentinal caries was identified and suggested for restorative treatment correctly by undergraduates than enamel and initial caries. The difference in identifying the lesions among them was statistically significant (p<0.05). Conclusion: Diagnosis of cavitated lesions and their treatment plan was more accurate than for the initial lesions by undergraduates when photographs were used. This finding suggests the use of photographs beneficial as a training aid and also calls for continuous training and retraining sessions for all students to diagnose dental caries in various stages and appropriate treatment plan. Background: Periodontal deterioration has been reported to be associated with various systemic conditions like Cardiovascular disease, Diabetes, Respiratory disease, Liver cirrhosis, Bacterial Pneumonia, Nutritional deficiencies and adverse pregnancy outcomes. Aim: To assess the periodontal disease among patients with systemic disease/conditions. Materials and Method: A total of 500 patients with systemic disease/conditions (Diabetes, Cardiovascular disease, Respiratory disease and Renal disease) and 500-age and gender matched controls without systemic disease/conditions were selected from the Government Hospitals in Bangalore City. The medical conditions were recorded and the periodontal status of the study population was assessed using the CPITN index. Results: The prevalence of CPITN Code 4 was found to be more among the patients with systemic disease/conditions (46.2%). The mean number of sextants with CPITN code 3 and 4 were more among the patients with systemic disease/conditions. The prevalence of CPITN code was found to be more among the patients with Respiratory disease whereas the mean number of sextants was found to be more among the patients with Diabetes, Cardiovascular and Renal disease. Conclusion: It may be concluded that the systemic diseases/conditions are associated with higher severity of periodontal disease. Background: Despite the adverse effects, tobacco chewing has gained a widespread social acceptance. Smokeless tobacco products vary considerably in form and content of toxicants and thereby in associated health effects. Aim: To estimate the pH and Fluoride content of extracts of different commercially available smokeless tobacco products. Materials and method: Unprocessed tobacco and popular brands of processed tobacco such as Zarda, Khaini, and Ghutka available in the local market of Mangalore city, Karnataka were used for the study. An extract of each product was prepared and the pH was determined in triplicates using a pH meter. Fluoride concentration was determined in triplicates using Spectrophotometer. Results: Khaini had a more basic pH, followed by Ghutka, Unprocessed tobacco and Zarda (5.16-8.89). Fluoride content was highest in unprocessed tobacco followed by Zarda, Ghutka and Khaini (1.1 -2ppm). Conclusions: The study concludes that Khaini had a more basic pH while the Fluoride content was highest in unprocessed tobacco. Background: Human skin is a reservoir of numerous microorganisms. Even though hand washing with soap and water alone reduces the microbial load, the complementary uses of hand antiseptics enhance the antimicrobial effect. Aim: To compare the antimicrobial effectiveness of two commercially available hand antiseptics, routinely used in dental practice, after hand washing with antiseptic soap. Method: A clinical trial with cross over design was carried out on 12 health care workers (HCWs). The antibacterial effectiveness of two hand antiseptics (Alcohol based -Sterillium and Herbal Based-Himalaya's 'Pure Hands') compared using fingerprint contact sampling on blood agar. Bacterial samples were obtained before and after hand washing (with antiseptic soap) and after hand disinfection. The data was tabulated and analyzed using one way ANOVA and Tukey's post hoc test for pair-wise comparison. Result: There was a slight decrease in the Colony forming units (CFUs) count following use of antiseptic soap when compared to the baseline values. A statistically significant reduction (p<0.000) in the CFUs count was seen following use of both hand antiseptics but the mean number of CFUs reduction was more in case of alcohol based hand antiseptic(sterillium) than herbal based hand antiseptic(Himalaya's 'PureHands"). Conclusion: Using alcohol based antiseptic soap before hygienic hand disinfection will provide maximum benefit in reducing the microbial count. Background: Patient satisfaction is an individual's appraisal of the extent to which the care provided has met his/her expectations and preferences. Patient satisfaction is critical for growth and prosperity of any dental service or practice. Studying patient satisfaction with dental care is one of the useful tool for evaluating the quality of dental services. Aim: To evaluate and compare the satisfaction level of patients being treated in outreach dental program and in the dental institution. Materials and method: A cross-sectional comparative study was carried out over a period of three months from June to August 2012, both in dental outreach program and dental institution. An interview was conducted among 150 patients, 75 patients in each group using pre-designed questionnaire consisting of 11 items addressing various dimensions of satisfaction. Patient's views were rated using a five point Likert scale. Student's t test was done to compare mean satisfaction score between the two groups using IBMR SPSSR Statistics 20. Results: In the outreach program, the highest mean satisfaction score was observed for the question on ease of reaching (3.5+0.5). In the institution, the highest mean satisfaction score was observed for the question on behaviour of dentists and staff (3.2 + 0.6). Overall there was no significant difference (p=0.78) between the mean satisfaction score of patients in outreach program (2.73 + 0.38) and in the institution (2.77+ 0.28). Conclusions: Our findings indicate that there was no significant difference in the level of satisfaction among the patients getting treatment in outreach program and in the institution except of few individual dimensions. Objective: The aim of the study was to determine the Prevalence of Dentin Hypersensitivity (DH) among adult patients in Bangalore city, India and to suggest most appropriate clinical method to diagnose dentin hypersensitivity. Methodology: All adult patients attending the outpatient Department of the Oxford Dental College in Bangalore were considered for the study. Patients with sensitivity were subjected to detailed intra oral examination and interviewed using a structured questionnaire. All the teeth were tested for Evidence of dentin hypersensitivity by the use of air blast & water from the air-water jet syringe and by scratching the suspected tooth surfaces with a dental probe. The responses of each tooth ofthe subjects were recorded on the visual analog scale (VAS). Results: An overall prevalence of dentin hypersensitivity was 6.4%. About 86.8% patients perceived their experience of dentin hypersensitivity as sharp and 13.2% patients experienced it as dull, cold acted as the common stimulant. Premolars and molars were the most commonly affected teeth, maxillary arch have higher number of sensitive teeth compared to mandibular arch. DH was more elicited on the occlusal surface followed by cervical surfaces of the teeth. The perceived response of DH on VAS scale showed a significant difference among the methods (p<0.001) with probe method eliciting the highest response on the VAS scale followed by the air for 10 seconds. Conclusion: The prevalence of DH among adult population of Bangalore city was 6.4%. Probe was considered as most appropriate method to diagnose Dentin Hypersensitivity. Background: It is axiomatic that Pediatric dental anomalies and enamel hypoplasia (E.H) are routinely encountered in primary dentition and early detection and prudent management of the condition facilitates normal occlusal development. Objectives: To determine the prevalence of various dental anomalies and enamel hypoplasia in preschool children between two to six years of age. Materials & Method: A total of 1898 children, between two to six years were randomly selected and screened for dental anomalies and enamel hypoplasia The chi square test was used to analyze the data statistically. Results: The overall prevalence rate of dental anomalies and enamel hypoplasia in this study was 0.63% and 8.95% respectively. Double teeth were the most frequently reported dental anomaly while supernumerary teeth were least reported. None of them reported with hypodontia. Aim: To assess the relationship between OHRQoL and Health Locus of Control (HLOC) using OHIP-14 and Multi-dimensional Health locus of control (MHLC) questionnaire among first and final year Dental and Engineering students in Bangalore city. 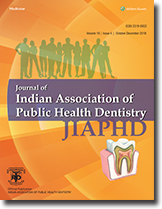 Methods: A questionnaire (OHIP-14 and MHLC) study was conducted among 600 (304 female, 296 male) first and final year Dental and Engineering students in Bangalore city. Spearman's correlation analysis was performed to correlate OHIP-14 and MHLC scores. Results: The perceived OHRQoL differed among students studying in different years of the Dental and Engineering course. Various oral problems such as decayed teeth and sensitive teeth were reported among Dental and Engineering students respectively. Regarding OHIP-14, statistically significant difference between all the groups was noted for the domain Psychological Discomfort (p=0.003) and Handicap (p=0.047) and statistically significant difference between first and final year Engineering students was noted for the domain Psychological discomfort (p</i>0.05). Similarly, statistically significant difference between all the groups (p=0.015) and between first and final year Engineering students (p<0.05) were noted for MHLC 'Internal' subscale. Significant positive correlation among Dental and Engineering students was observed between 'Power' scores and all the domains of OHIP-14. Conclusion: This study suggested weak relationship between OHRQoL and HLOC. Relatively lower 'Internal' scores among Engineering students calls for professional intervention. Aim: To evaluate the prevalence of craniofacial and dental anomalies among different developmental disorders in mentally challenged subjects of various special schools. Material and Methods : A cross sectional study was conducted in four rehabilitation centers for mentally disabled subjects in Bhopal City. Atotal o f296 subjects with age range of 5-15 years were screened and findings were recorded in specially prepared proforma. Results: Among 296 subjects, 73 were of Down's syndrome (DS), 168 of mental retardation (MR), 31 of autism (AT) and 24 of cerebral Palsy (CP). The anomalies were found to be predominant in syndromic mental disability compared to non-syndromic disorders. High vault palate was the most common developmental anomaly amongst all the four disabilities. Gingivitis & hypersalivation was noted as an additional finding in all the subgroups. Conclusion: Craniofacial and dental anomalies usually supplement mentally challenged children, leading to poor performance of stomatognathic complex. Therefore critical appraisal of oral health status of such subjects is imperative. In 2002, the American Academy Of Pediatric Dentistry had developed the Caries-risk Assessment Tool (CAT) based on a set of physical, environmental and general health factors. One of the components of CAT is children with chronic medical conditions requiring long term medication being at a risk of dental caries as a side-effect. Children on long term medication due to medical conditions consume syrups in bulk. The child's oral health is often neglected due to the preoccupation of the parent with the child's medical problem. Sometimes physicians are unaware of the high sugar content of medications. This review explores the detrimental effects of paediatric medications on oral health administered to chronically ill children and the risk to which children are exposed unknowingly. The tremendous impact of plant based products is evident in every facet of human lives. The progress of science has resulted in developing transgenic plants which would prove to be a boon when translated into edible vaccines. Such vaccines would bring about wide reaching changes in the prevention of an array of diseases because of their accessibility and economic viability. Cautious production of edible vaccines under stringent guidelines would endow developing nations with innumerable advantages in disease prevention.